Had another jolly weekend stuffed solidly with films. 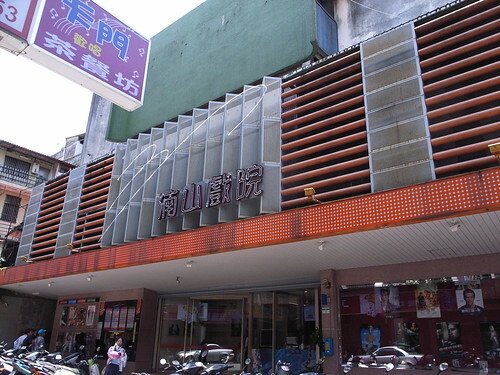 Thanks to Nanshan Theatre (湳山戲院) in Taipei, where offers 8 good films of great taste (the commercial Hollywood and some European) at a time at a low price (130 NTD, less than4 quid, and yes, 8 films), writing some comments about movies somehow became my weekly assignment. So I did had a great time watching 5 on two weekends, I Am Love, Seasons of Witch, Paper Castle, The Next Three Days and one that I don't recall...Perhaps too much for 14 days. A weekend like this is truly satisfying. Speaking of movie theatres, I personally prefer going to the theatre instead of downloading or watching online or DVDs from Blockbuster. I can't stand the lousy (and sometimes ridiculous) subtitle translation and I simply enjoy the atmosphere of sharing the emotional moment with some other. Yeah, Price is a thing. In Taiwan theatre like this sort is called 'Second Round', which means they're not as good as the chained theatres and play movies that are not the latest. It's the best choice for movie lovers or students who are unable to afford the pricey tickets (approximately equals to 2.5 McDonald meals). In this sense the sound effect might not be as good and the seats may be a bit shabby and without a place to put your cola and popcorn. Nonetheless, second round movie theatre remained quite popular in the past decades. Also, locations matter. Many situated around night markets or university campus. You can just spend the whole day in and out (yes you can go for a lunch nearby and get in for another movie later) with one ticket and a stamp on your left hand. Isn't it brilliant? Thanks to this lovely place, I find it utterly comfortable to go to the movies along and fully enjoy the afternoon hours of my own.